I highly recommend that you purchase this book; moreover, it would be a good idea to give copies to anyone you know in positions of authority, such as your MP, local councillors, clergy, teachers, leaders in the police, or your school, college or university library. Its central idea is incredibly simple, which is why it works: in the past, translations of the Koran in chronological order were available which make crystal clear Mohammed's supremacist violent intent against non-Muslims, which developed throughout his 'career'. But in recent years these have been replaced with translations which jumble the chapters in order of length, making a badly written turgid book even more impenetrable. This book takes a standard English translation, by a convert to Islam (so that the translation can't be accused of being anti-Islamic), and places it in reverse chronological order, so that as Mohammed's 'revelations' became increasingly violent, cancelling earlier more peaceful 'revelations', this is crystal clear for all to see. Moreover, the most important passages where us 'infidels' are concerned, are in bold, making it much easier to look through and see these in context. It becomes crystal clear how the Koran, Muslims are over and over and over told that they are superior to non-Muslims, and how violence, war, and a division between Muslim lands and infidel lands in perpetual struggle, is dyed into the wool of the Koran. 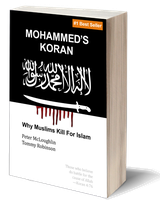 The book has a foreword of about 100 pages which is short enough to be readable by a large audience, yet long enough to show with great rigour how in recent years our politicians have been deceiving us that Islam is a 'religion of peace', and provides very useful and very well researched background. I've been studying Islam myself for some years and found the foreword well researched and informative. There is increasing interest in university students to study Islam but even here they are not necessarily getting an unbiased account. Read this book. There are plenty of references to check what the authors are saying in the foreword. And the Koran of course speaks for itself. Why oh why, don't our leaders listen? That is the central mystery.